Are you physical or are you digital? This sums up the divide between brick-and-mortar retailers and online businesses led by the likes of Amazon over the past few years. Recently, though, the digital-physical divide has blurred, as traditional retailers have embraced online selling like never before. Discount behemoth Walmart, for example, boasts the second-highest internet sales in the U.S.
Read also: See how mail gets your brand into your customers’ hands – and into their homes. It works the other way, too, as more and more online retailers are deciding that digital-only is not the best strategy. They’ve discovered that even in today’s digitally-mediated world — or maybe because of it — tangible interactions with products and brands can lead to better engagement with customers. As a result, digital retailers are increasingly creating physical presences to more effectively reach their consumers and drive sales. An example of this is mattress seller Endy Sleep. The Toronto-based company established itself as a made-in-Canada manufacturer of high-quality mattresses at a fraction of the price of comparable big-name brands. A key part of its value offering is factory-to-home, same-day delivery, backed by a 100-day, money-back guarantee. But Endy’s “mattress in a box” has not proved to be enough for a sizable portion of its potential customer base – people who need to interact with the product firsthand. “We found that there is an appetite for customers to actually come in and try out the mattress before they go and invest $750 for a queen,” explains Aashish Nathwani, Endy’s marketing director and co-founder. 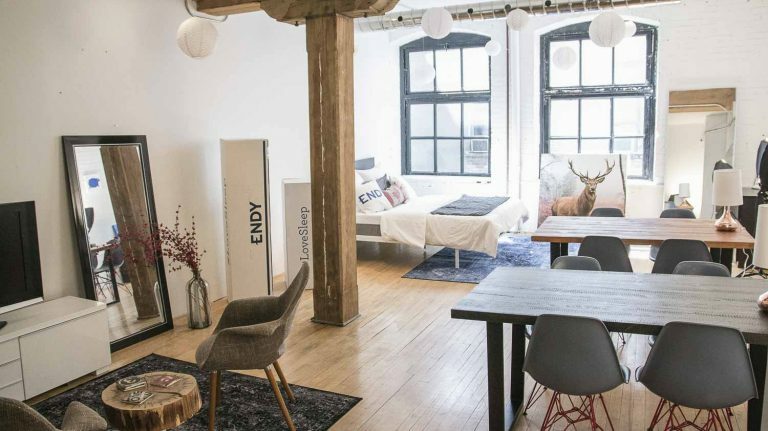 As a result, Endy set up a showroom adjacent to its head office in downtown Toronto. Not only can potential buyers have a real-life trial of the company’s premium memory foam mattresses, but they also get a taste of the digital company’s culture. “It is a great experience for customers as they can see how our team operates,” he explains. The Toronto showroom has proven so popular that the company recently opened a “pop-up” Endy store in downtown Montreal for a 30-day period. As with the Toronto location, the retail outlet was in the middle of that city’s furniture design and retailing hub. “It was really designed to give a new audience, people who couldn’t come to our Toronto showroom, a chance to try out the product,” says Nathwani. The temporary location provided a noticeable lift in the market in terms of people visiting the store, clicking on the website and, ultimately, sales. Endy is now thinking about debuting pop-up locations in other cities across Canada. A savings account with a side of coffee? Direct bank Tangerine (formerly known as ING Direct) is another digital-based company that is carefully dipping its toe into the physical realm. The bank operates five “Cafés” in major cities across the country that allow existing customers to learn about the products and interact with employees in the flesh. Would-be customers also get a chance to know the Tangerine culture. Those Café locations serve as the organizing centres for the bank’s charitable endeavours, most notably its Bright Way Forward national sponsorship and community investment platform. “Having that physical presence in each of the cities really allows our teams to work with our local partners on the ground to help deliver that program,” says Kochel. Since last year, Tangerine has also opened a series of pop-up locations across the country for six to 12 month appearances. Sharing many of the stylish attributes of the Cafés, the pop-ups are noteworthy because they are state-of-the-art shipping containers that, naturally, can be transported anywhere they are needed across the country. They serve primarily as massive tangerine-colored billboards for potential new customers. “We often say they are for people who need a little extra nudge to discover what direct banking is all about,” Kochel explains. As well, Tangerine operates two in-mall kiosks in Montreal and Quebec City that similarly serve to sign up new customers. Plans are to add more kiosk locations in the future. Despite its expanding physical presence, Tangerine intends to remain a digital-first bank. Offering “touch points” can have important applications beyond retail. In the world of marketing, for example, marketers are increasingly realizing the benefits of employing both physical and digital media to reach and persuade customers. Research Connecting for Action neurophysiological Research from Canada Post shows that integrated direct campaigns elicit 39% more attention (time spent) than single-media digital campaigns. In fact, integrated direct mail and digital campaigns prompt 8% higher brand recall than single-digital campaigns; integrated campaigns also trigger 5% more emotional intensity than digital-only campaigns. It’s just another example of something companies like Endy and Tangerine are discovering: bridging the gap between digital and physical can make the impact real for your business.